Visit the Nature Centre's Upcoming Events page and ECFNC Activities page for upcoming programs (updated). The Windsor Butterfly Count will be held on Saturday, July 8. Meet at the nature centre at 8:30 am. Sunday, June 25: Carl Pascoe and Rachel Powless from the Holiday Beach Migration Observatory came to the nature centre this morning to band hummingbirds. 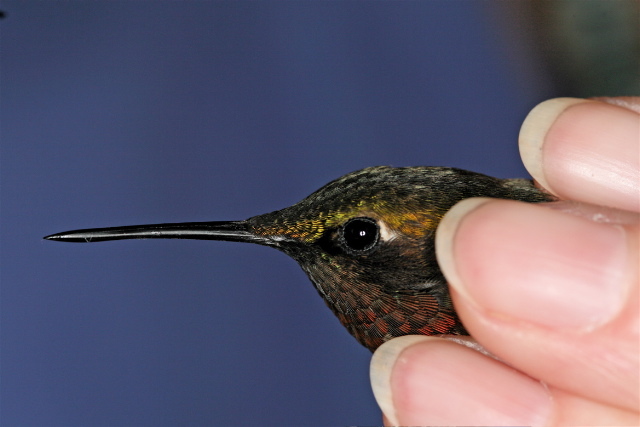 In three hours they banded three male and two female Ruby-throated Hummingbirds. Saturday, June 24: The dragonfly program today recorded the following species at Ojibway Park: Slender Spreadwing, Marsh Bluet, Orange Bluet, Fragile Forktail, Eastern Forktail, Common Green Darner, Prince Baskettail, Common (Eastern) Pondhawk, Dot-tailed Whiteface, Widow Skimmer, Twelve-spotted Skimmer, Blue Dasher (the most common dragonfly seen today), Wandering Glider, Common Whitetail, Ruby Meadowhawk and Black Saddlebags. Monday, June 19: A male Black-throated Green Warbler was heard singing this morning behind the nature centre. Twinkling lights fill the air over prairie and meadows on warm evenings. Look for different blinking patterns such as single rapid, single slow or a series of rapid flashes which indicate different species of fireflies. The adult mayflies are well known for their brief (ephemeral) adult lives, just a few days at most. They do not feed or drink during their short existance. They mate in swarms and the females return to the lakes to lay their eggs. The nymphs play an important ecological role as they feed on algae and in turn are eaten by fish.